My 6-year-old son and I are in the car out in front of the house. 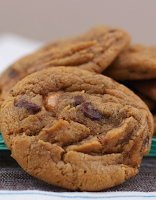 I open a bag of chocolate chip cookies -- one of our favorite treats, second only to M&Ms. I let the sweet aroma fill the car. ME: You want some of these delicious cookies? ME: Then you gotta help me sneak ‘em into the house without Mommy catching us. You help me do that, and you can have three whole cookies. How’s that sound? MY SON: You gotta be kidding, right, Daddy? Whaddaya think I am -- a baggage handler? What’d I do for you on Halloween, when I handed over those Milky Way bars? What was that -- a game of Candyland or somethin’? ME: No kid of mine is gonna talk to me like that. I don’t have to give you any cookies at all. I could’ve had Grandpa call Mommy on the phone to distract her while I snuck these cookies inside. MY SON: So why didn’t you? And who are you calling a kid? I’m 6 years old. I’ll be 6-and-a-half in a few months. ME: Oh, so you’re a big shot now, huh? You think you can make it in the big world all by yourself? MY SON: You kidding, right? ME: Okay, big shot. You’re so big. There’s a bag of M&Ms I’ve got stashed in my desk. Pure milk chocolate. I want you to sneak these cookies into the house all by yourself, and if you’re as big of a big shot as you say you are, get these cookies into my bottom desk drawer without Mommy catching you. You do that, and that bag of M&Ms in my desk is yours. Do you know how to handle Mommy? MY SON: Sure. But it’s gonna cost you more than a bag of M&Ms and three cookies. Sneaking sweets into the house is no duck walk anymore. Mommy’s like the Navy. She’s got EC 2s with satellite tracking. She sees everything. And that’s ‘cause she’s serious about eating healthy. So I want the M&Ms and I also want half the cookies in that bag -- not just three. ME: You’ve got guts making demands like that. MY SON: In this world, Daddy, you gotta have guts. When you got guts, you get the power. And when you got the power, you get the sweets. Me? I just want what’s coming to me. ME: And what’s coming to you, son? MY SON: The world, Daddy, and all the cookies and candy in it. I close the bag of cookies and drop it into my son’s lap. I step out of the car. ME: Meet me in your room in 10 minutes. That’s when you’ll get your M&Ms and your cookies. But if Mommy catches you, you won’t see another treat ‘til high school. I leave the kid in the car and wander into the house. He isn’t far behind with the cookies. MY WIFE: Where’s our son? The kid enters, cookies in his hands. MY WIFE: Where’d you get those cookies? I wonder what the kid is up to, cookies out in the open. His idea of smuggling is different than mine. MY SON: Daddy gave me the cookies. I can’t figure the kid’s strategy, but he’s got me fooled for sure. MY SON: Daddy wanted me to sneak these into the house. He also has a big bag of M&Ms in his desk. And this is the nightmare I have, just before I decide not to buy cookies at the store. I pick up a gallon of milk and a book of stamps -- the only items I’m supposed to get -- and I head home.